Many said to me that this would be a journey of a lifetime, a journey that would make changes, a journey to deepen and support my faith and work. But little did I know how those words would become true, little did I know the full importance that this journey would have. As we embarked on this special journey we made all the necessary arrangements to ensure that it would go smoothly and that all would be well. I feel especially blessed that we were to be in such good company and to have deeeply spiritual words from those who led the group, as we journeyed through the pilgrimage. The blog, as written, is an account of that journey and sets a record for the days we spent and the places we visited. Inside of that account there is a greater story, the story of what has happened inside to everyone of us as we journey along our lives and along this pilgrimage. We were brought to the place where Jesus carried out his ministry and in those places we could trace and feel His presence and God’s presence in that part of the world. The city of Jerusalem, as an example, important for all three Abrahamic faiths and yet conflict is high. 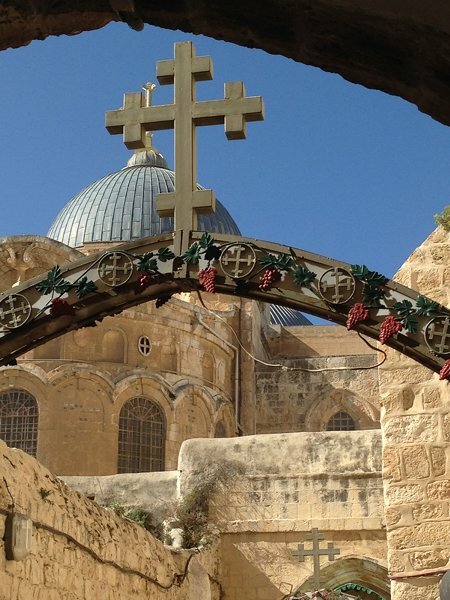 Bethlehem, where the walls are 20 feet high and the entry in and out of the city for Palestinians is often not possible, is the place where Jesus was born and still has that sense of chaotic and fragile lifestyle. For me, it is the place where I met a bag seller, Mahmoud, and despite being told that we should not buy from people on the streets, we set up a conversation and exchanged thoughts about our faiths and our humanity. I purchased a bag and Mahmoud bought us coffee where three pilgrimas sat with him and talked for a while. The Garden of Gethsemane, which was warm and inviting and the ancient olive trees, some over 2000 years old, the gardeners who tended this place and calmly working amongst the trees and the view across to Jerusalem, the Kidron Valley and the walls of Jerusalem on the other side of the valley. And on that night before Jesus was handed over to the guards, Jesus stayed here and watched and waited for the morning, looking at the Jerusalem that we also could see. What pathos was hanging in the air, how often do we feel, that we would like some of our burdens taken from us? The Sea of Galilee, at the beginning of our journey, where we met the stillness of the waters, the calm and the peace that will invade my heart forever, the shore where Jesus called his disciples and spending time with my feet in that water, feeling the healing and the peace, being called by name. And so with strength to journey on and share and meet with others I know that this pilgrimage, this journey will be part of my life, and the prayer which is a pilgrims prayer from another place to guide and to call and to know that it is good that we have come to the Holy Land. Set out! You were born for the road Set out! You have a meeting to keep. Where? With whom? You don’t yet know, Perhaps with yourself? Set out! Your steps will be your words the road your song the weariness your prayer. And at the end your silence will speak to you. Set out! Alone or with others; but get out of yourself. You have created rivals you will find companions. You envisaged enemies You will find brothers and sisters. Set out! You were born for the road. The pilgrims roadSomeone is coming to meet you is seeking you, so that you can find him. In the temple at the end of the road In the shrine at the depths of your heart. He is your peace He is your jo Go, God already walks with you.